This week, I’m giving away two sets of these Staub mini cocottes and two signed copies of the book on Instagram! The cocottes are my favorite thing–they can be used for all sorts of things, from these crumbles to little mini shakshukas, baked pastas, mini cobblers, tiny hotdish, and more. The giveaway ends next Friday, November 9 at 12:00am. Make the jasmine-soaked pears: Place the tea in a medium bowl. Bring the water to a boil and pour it over the tea. Let steep for about 10 minutes, until very strong. In the meantime, core and dice the pear. Add the diced pear and sugar to the tea. Stir to dissolve the sugar, then cover and let soak in the refrigerator for 1 to 2 hours, or up to overnight for best results. Alternatively, if you’re pressed for time, simmer the pear with the tea and sugar in a small pot over low heat for about 20 minutes, until the pear tastes strongly of jasmine tea, then let cool. 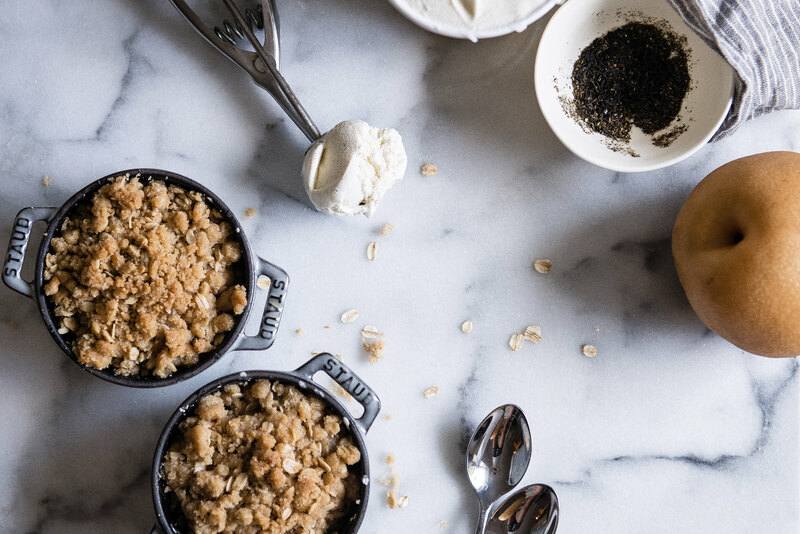 This will result in a softer crumble, but it will do just fine. 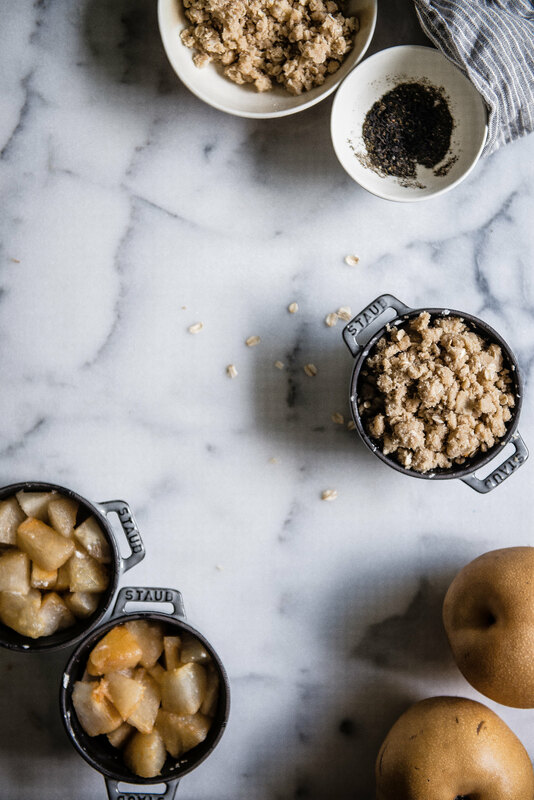 Make the crumble topping: While the pear is soaking, preheat the oven to 350°F. In a medium bowl, combine the oats, flour, sugars, ground ginger, and salt. Using your fingers, mix in the butter until the mixture forms clumps the size of peas and the consistency resembles wet sand. Remove the pear from the tea and divide between 2 and 4 oven- proof ramekins or mini cocottes, depending on the size of the contain- ers. 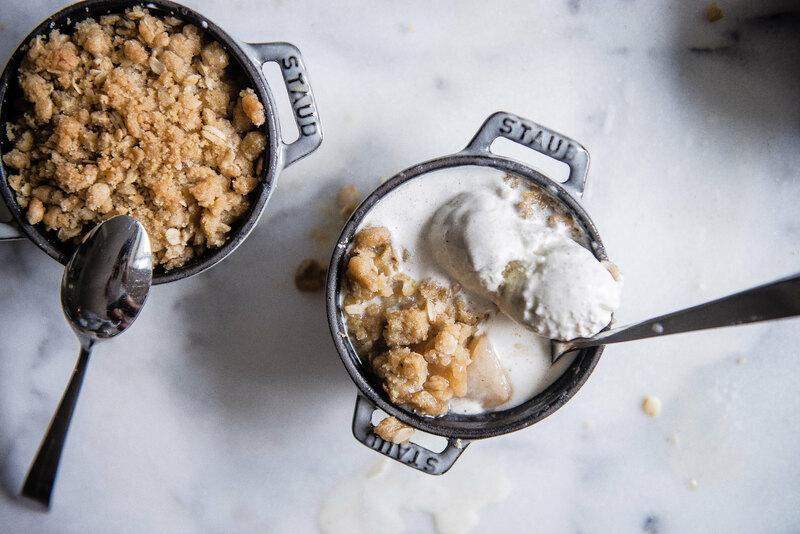 Divide the crumble topping evenly among the ramekins. Bake for 10 to 15 minutes, until the topping is browned and crisp and the filling is bubbling at the edges. Serve warm, with vanilla ice cream, whipped cream, or yogurt. Asian pears are fragrant and juicy, with a fresh crunch that sets them apart from Western pears. They’re also a bit grainier, and the high water content usually makes them less attractive for baking from fresh. 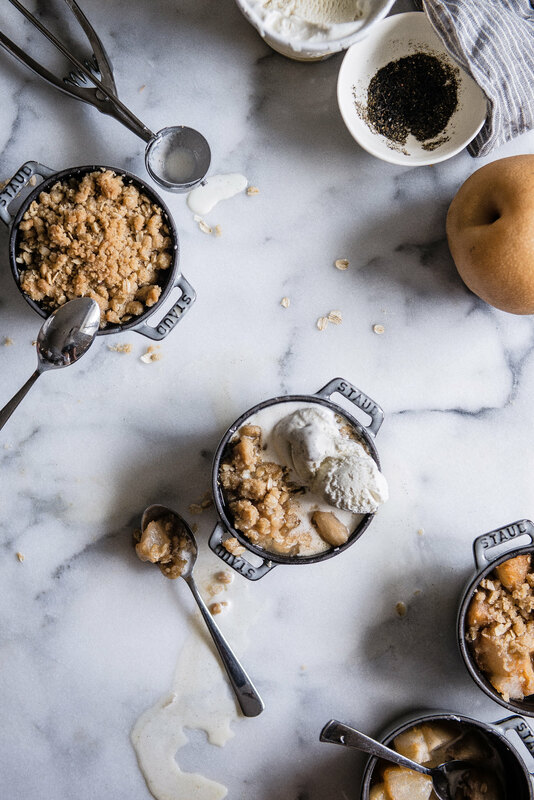 But the sweet f loral quality is a perfect complement to jasmine tea, and when the pears are softened in tea overnight, they will release less water during baking and cook beautifully into the crumble. You can find Asian pears in almost all Asian supermarkets, especially Korean and Chinese ones, and you’ll even find a similar variety (sometimes called “apple pears”) in some mainstream grocery stores now and again. If you can’t track them down, though, Bosc or Bartlett pears will work just as well. « gochujang eggs in purgatory // a common table giveaway! Bill, that is the best news. Thank you so much for getting a copy, and for your comments–it really means so much! The cocottes look adorable and you did them justice with such an amazing recipe! Lovely! 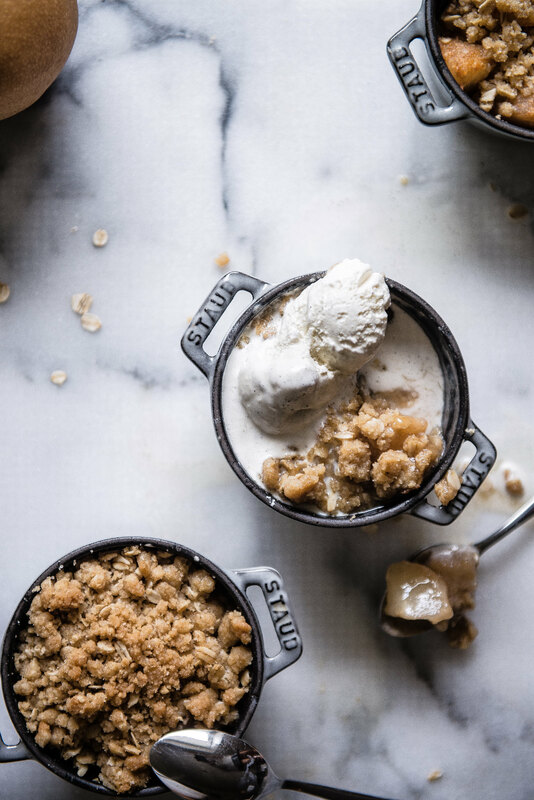 I never thought I’d say this, but those crumbles look delicious!